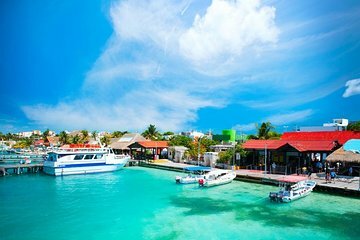 Travel efficiently between Cancun and Isla Mujeres with a convenient ferry ride from either of the two popular destinations. Simply board the Ultramar catamaran for the 45-minute ride, with a choice of one-way or round-trip ticket from Puerto Juarez (Cancun) or Isla Mujeres. Ferries depart every 30 minutes, making it easy to catch the boat at your convenience. Enjoy the breezes and views as you glide across the Caribbean with this deluxe ferry service. My mistake was to purchase a ticket on the Ultramar ferry from viator. Upon arrival at the Ultramar office to exchange my voucher for a ticket to Isla Mujeres, the staff could not find my reservation. After 15 minutes of searching, I gave up, and purchased a ticket right there. I lost the money I had paid for a voucher, but gained knowledge in the future, to pay on the spot. There isn't much to review about this trip. It was a simple ferry ride from the mainland to the Island. It was a nice, warm, sunny day that made for a pleasant ride. We rode both ways on the upper deck to take advantage of the beautiful weather. The seating area that we were in was nice and clean. The seats were as comfortable as you could expect for a ferry. Once we got up to full speed, there was quite a bit of wind to deal with so keeping your hat on or your hair in place was a struggle... something to think about before electing to ride on the upper level. On the way back, there was a singermusician playing a guitar and singing songs and taking requests. It was a nice touch to accentuate our trip back to the mainland. We never knew if he was an employee of the ferry, or just another passenger who was performing for tips... we tipped him a few bucks. I can't think of anything about the ride, either way, that I was disappointed or upset with. From what I can remember, the price wasn't anything outrageous. Sortie sympathique même si le site est envahi de touristes. A la sortie du ferry, de nombreux taxis vous attendent pour vous conduire sur les plages. Ne sachant pas où elles se situaient, nous en avons donc pris un. Presque pour rien car l'une d'elles ne se trouvait qu'à 500 mètres à pied à la sortie de l'embarcadère à gauche. Après la baignade, il est possible de faire un petit tour sur le marché où on peut acheter des souvenirs, mais également se restaurer. Pour les adeptes ou amateurs du snorkeling, n'oubliez pas votre matériel car les plages de l'île aux femmes se prêtent bien à cette pratique. Not cool! Overpaid by 15 USD per person. Paid 23.98 roundtrip per person. When we went to exchange our vouchers for tickets, the price listed on the actual tickets was 146 pesos8.71 USD. I suggest you buy your tickets at Puerto Juarez. No need to worry about them running out as they have multiple boats every half hour. Infelizmente nao pude fazer esse passeio porque o porto de saída não era onde eu pensava Playa Tortugas - de onde saem os Ferries para lá. Com isso cheguei atrasado e perdi o transporte. Uma pena..
We did not get the trip we purchased. Your offices were closed by the time 9:30 we arrived at Puerto Juarez. We ended up having to purchase tickets with another company. I was not pleased at you stranding us. Islas Mujeres is too commercialized for my preferences. Ferry trip was fine. The ferry ride was great however a shuttle service should be included from hotel to Puerta Juarez due to it being away from everything else. Not an easy transportation arrangement. After being frustrated with not being able to ride bus there and time wasted we finally took a taxi.